The Ontario Plan is a dynamic framework for sustained, comprehensive leadership in building our community. It integrates components of city governance documents that are typically disconnected. 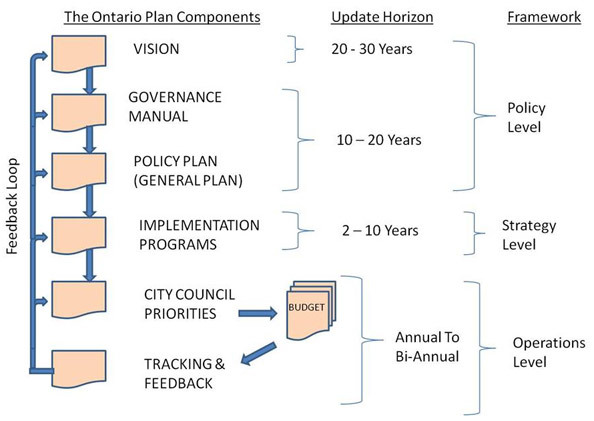 The Plan states community direction at a point in time (2008) and integrates it into a single guidance system that will shape the Ontario community 20 years or more into the future. The Ontario Plan provides for lasting policies to accommodate change. It consists of a Vision, Governance Manual, Policy Plan, City Council Priorities, Implementation Plans and Tracking and Feedback.